Last week, when rumors were quickly spreading about various coaches who might seek out the vacant Kansas football head-coaching position, some writers started to take critical looks at their hometown coaches. They were upset just thinking that their head coach might leave town to try to fill the large void left by Mark Mangino. No need to chuckle for too long about that “large void” line…let’s move on. Over the weekend, the Turner Gill, formerly the head coach of the Buffalo Bulls, accepted Kansas’ offer to become the football team’s next head coach. The Stanford community no longer has to worry about Jim Harbaugh possibly moving East and the State of Mississippi can relax knowing that Houston Nutt is not going to be leaving any time soon. When it looked like Nutt was considering the Kansas opening, some reporters got all out nasty when discussing the coach. One, in particular, waged all-out war-of-words on his agent, Jimmy Sexton. Look no further than the googly-eyed one’s agent, Jimmy Sexton. Sexton looks exactly like you’d expect a slightly reptile sports agent to look and acts like he’s been scripted by Jerry Bruckheimer. Sexton represents about half of the coaches south of the Mason-Dixon line and is almost certainly the “source close to Houston Nutt” cited above. 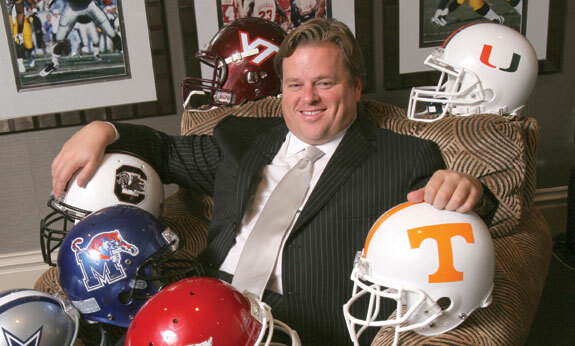 In November 2006, he brought Butch Davis back to the college ranks at North Carolina. A year later, despite a 4-8 start, Davis received a contract extension and a raise from UNC, a response to rumors that he might leave Chapel Hill and take the vacant job at Arkansas, his alma mater. Even though Davis vehemently denied the chatter, he still received an extra year and $291,000 more per season.Sexton is the coaching equivalent of sleazy, soul-patched pickup artists displaying “PUMA SKILLS“; there’s nothing to see here except posturing and possibly a Nutt contract extension. The picture referenced in the first link (which is at the top of this post) is a little disturbing, but does Sexton really deserve the “sleazy, soul-patched pickup artist” comparison?